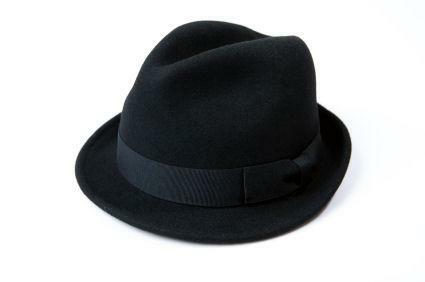 A fedora is the classic topper when you're dressing as a Blues brother. Blues Brothers costumes are a lot of fun for men and women dressing up for any occasion. The classic look for Jake and Elwood is pretty easy to get with items you might have around the house or that you can easily buy at a used clothing store. The Blues Brothers are a great choice for a DIY costume because it's so easy to come up with all the basic pieces yourself. As you might recall, both Jake and Elwood wear black suits and white, long-sleeved button down shirts with skinny black ties. They also sport signature sunglasses (Raybans in the movie), white socks, black shoes and black fedoras. If you want to get even more specific, Blues Brothers Central gets down to the nitty gritty of the Blues Brothers outfits, down to the fact that Jake wears a belt but Elwood does not, the number of buttons on their jackets and the tattoos on their hands. Read this site and take all the details you want to make your costume as authentic as you want. While both men and women can dress as the Blues Brothers, there are other fun parts from the movie that might inspire costumes. For instance, a great costume for a woman would be the role played by Aretha Franklin in the movie, Mrs. Murphy: it just takes a pink waitress outfit, a red vest and a pair of fuzzy slip on pink slippers. For group costumes, consider throwing in members of the country band, the Good ol' Boys, who torment the brothers, or the police officers who finally chase them down. Really any character in the movie would make for a fun costume. Get together a bunch of friends, watch the movie and decide which characters each person would play. In fact, the Blues Brothers would be a great theme for a costume party, since the movie has such great music. You could get people to dress up, listen to the soundtrack or watch the movies, eat some good soul food and have a great time. Blues Brothers Central has hats, glasses and a narrow silk tie. Century Novelty has the sunglasses. Anytime Costumes has glasses and a fedora. It's likely you could also pick up these items at your local vintage clothing store or even the Salvation Army thrift store. If you have some time to shop before the big event, you can probably find everything you need for your costume locally. Dressing like the Blues Brothers is one thing, but to pull the costume off you really need to act like the Blues Brothers. This is another reason watching the movie before the event is a great idea. Don't forget classic lines like "we're on a mission from God," "I hate Illinois Nazis," and "it's 106 miles to Chicago, we got a full tank of gas, half a pack of cigarettes, it's dark, and we're wearing sunglasses." Elwood should go around asking for dry toasted white bread, while Jake wants fried chicken and a Coke. And of course you should never take off your sunglasses. The Blues Brothers are an obvious choice for grownups, because there is a fair bit of swearing and drinking going on in the movie, but dressing kids up in little suits so they can be the Blues Brothers too is really cute. This is a costume idea that every member of the family can embrace and have a lot of fun with. Whether you want to dress like a police officer, a nun, a waitress, a blues musician or a Blues brother, there's something for everyone here.